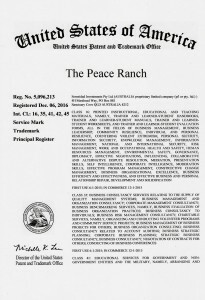 We are delighted to announce the US Patents and Trademarks Office has also registered our second Trademark The Peace Ranch® under all of the following Classes. 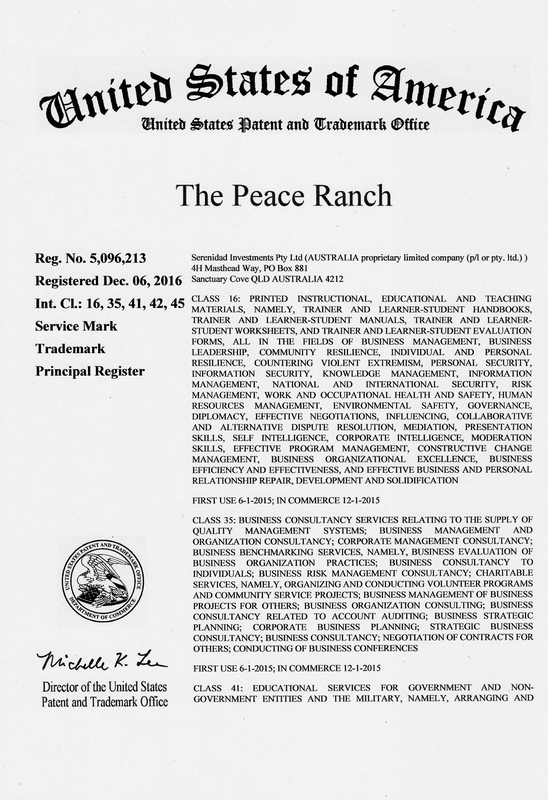 business leadership, efficiency and effectiveness, business management and organizational excellence, corporate intelligence, governance; community resilience, individual/personal resilience and security, self-intelligence, countering violent extremism, national and international security, diplomacy, information security, knowledge and information management; risk management, work/occupational health and safety, environmental safety; HRM, effective negotiations, influencing, collaborative and alternative dispute resolution, mediation and moderation, presentation skills, constructive change management, effective business and personal relationship repair/development/solidification; effective program management. strategic planning and business consultancy, corporate business planning, quality management systems, business management, organizational and corporate management, business bench-marking, business risk management, management of business projects for others, account auditing, negotiation of contracts for others; and charitable services (volunteer programs and community service projects). mentoring and coaching for individual and organizational effectiveness, development and progression; structured education in the fields of business leadership, efficiency and effectiveness, business management and organizational excellence, corporate intelligence, governance; community resilience, individual/personal resilience and security, self-intelligence, countering violent extremism, national and international security, diplomacy, information security, knowledge and information management; risk management, work/occupational health and safety, environmental safety; computer systems, business audits and investigations; HRM, effective negotiations, influencing, collaborative and alternative dispute resolution, mediation and moderation, presentation skills, constructive change management, effective business and personal relationship repair/development/solidification; program, project and financial management; education and university advisory services (including design, development and delivery of curricula for schools, universities and the like); business conferences and exhibitions and organization of same; providing facilities for education. of IT and engineering, occupational health and safety including ergonomics, technology planning, disaster recovery for data communications, and computer security. threat analysis for protecting public safety in the fields of homeland security, international security, personal and corporate/organizational security; security and related advisory services (e.g. security assessments of risks for government and non-government), finger print analysis, forensic advice for criminal investigations (e.g. expert witness); crime prevention advisory services; legal consultancy services (e.g. 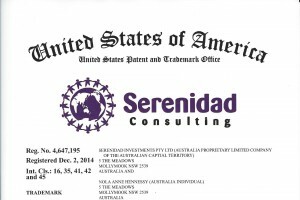 patents, copyright, trademarks and other IP matters), legal research, providing expert witness legal advice; mediation, arbitration, alternative dispute resolution, collaborative alternative dispute and conflict resolution. 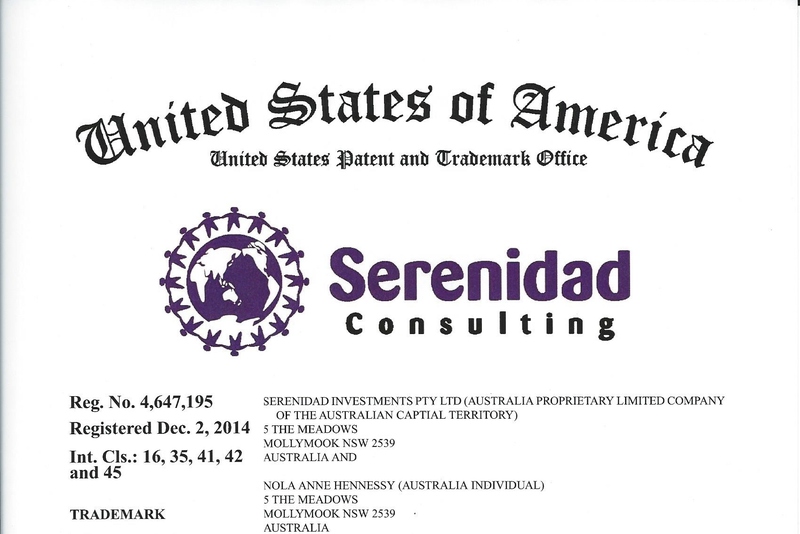 Coupled with its strategic intent, the above classes of services enable Serenidad Consulting® to provide well focused, quality-assured and strategically significant outcomes for its clients around the globe.